does foster care require all of us? Being a foster parent comes with its share of immense responsibility. 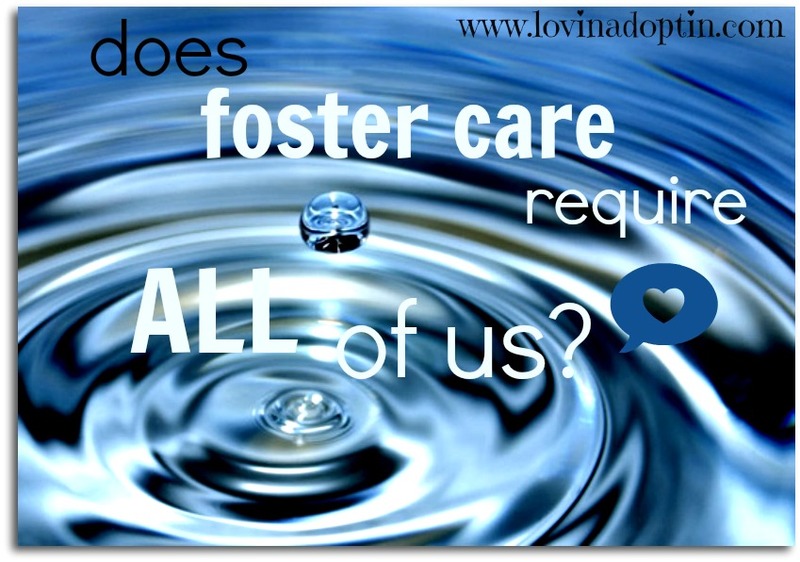 What type of foster parent are you going to be? How are you going to treat the children? Too many times I see foster parents who don’t take their “job” seriously. They almost see it as babysitting. Once in a while I come across a foster parent who really gets it. It’s all about the kids and their healing process. They forego everything trivial in their lives to help one child. They see they can make a difference in one person’s life, forever. One of those is a woman named Janelle. She has laid down her life, and so has her husband, to be the parents their foster/adopted children need. Those children come first, no one else. When Janelle and her husband decided that they weren’t going to do foster care any longer (they have adopted one through foster, and are about to adopt the other), their case worker said, “We’ll be losing a great foster home.” It was a great compliment. Some think that if you’re a foster parent you just keep on rolling the kids through. That’s not my perspective. Children need to live in one home, with one loving family so they can become whole. It’s a rare case when bio parents can get their act together enough to parent the child they have neglected and/or abused. These kids also need a lot of attention and focus from those who have committed themselves to loving them. Their minds have been filled with hatred, fear, great inconsistencies, and of course neglect and abuse. It’s going to take time. Time. Time. Time. How much time do we have? I know in Janelle’s heart, she would love to help more children, but she has decided to face reality. She is being realistic, and knows she would have too much on her plate if she were to take care of another foster child. She knows what they need. My husband and I gave up going to the gym during the three years we were fostering. I gained weight, my husband lost muscle that he had worked for so many years to attain. We lived life differently. Our family was the priority. Not the block party, or dinner with friends. We didn’t get many date nights because we knew the children wouldn’t do well with a stranger watching them. So, what would you give up so that you could help a child? Is there anything that can be moved around in your life? Adjusted? Thrown out? This entry was posted in Uncategorized and tagged perspective, priority, time. Bookmark the permalink.